In the early 1900s no public park was considered complete unless it had a bandstand with musical entertainment during the summer months. Roath Park’s bandstand, built in 1903, was in the Botanic Garden immediately below the Promenade (or lake embankment as it was then known), approximately where there is now a children’s play area. 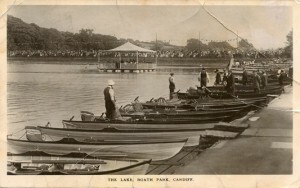 Before 1903 there were band performances on the lake embankment, with many spectators hiring boats to secure a good position to enjoy the entertainment. 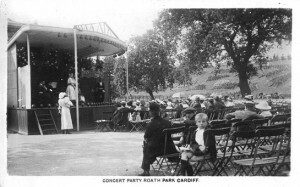 So popular were the bands, that in October 1902 the Parks Superintendent, William Pettigrew, recommended that Roath Park have a permanent bandstand in the Botanic Garden. 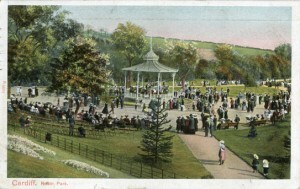 Although not welcomed by the boatmen, who anticipated a loss of income, construction went ahead and the bandstand rapidly became a popular feature of the park, appearing in many early postcards, such as the one below, postmarked 1909. From 1902 the Council’s Parks Committee allocated £250 each year to hire bands to play in all Cardiff’s parks. During the season from May to August bands were engaged to play in the parks on one weekday evening, which for Roath Park was Wednesday. In the case of Roath Park, two additional evenings were paid for by the Tramways Committee, which wished to ensure that the new tram service there was well used. Tenders were invited from local bands and among those engaged to play were the Post Office Band, the Imperial Yeomanry Band, the Cardiff Military Band and the Canton Brass Band. A Western Mail reporter visiting Roath Park one evening in July 1906 observed that “there is chair accommodation for 500 people around the band-stand, and it must be doubled if demand is to be met.” On this occasion the chief attraction was a performance by the Cardiff Military Band. As well as noting that all the chairs were occupied, the Western Mail’s report said that “the promenade [i.e. the broad path around the bandstand] was thronged with gaily-dressed ladies and their friends. Overlooking them was a dense moving crowd on the lake embankment”. In 1911 electric lighting was introduced in Roath Park on the bandstand, the lake embankment and the paths approaching the bandstand. As a result, the season for band performances could continue for an extra six weeks, and the lighted sections of the park remained open for two hours beyond the normal closing time. Sometimes bands would perform from a floating bandstand on the lake. The postcard below (postmarked 1912) shows such an occasion, with the audience assembled on the lake embankment. From 1911 more varied entertainment was introduced in the form of costume concert parties, also known as Pierrot shows. These could not take place from the bandstand, so a temporary stage with canvas sides was built and the bandstand served as a dressing-room. At the end of the 1912 season Pettigrew reported that the new venture had been a great success, both in popularity and financially – the cost of the Pierrot shows was 30% to 50% less than for the band performances, while the income from them was, on average, 45% more. For the 1915 season professional concert parties were engaged for complete weeks of performances and these subsequently became the main musical entertainment at Roath Park. While performances were from a temporary stage attached to the bandstand, the audience sat on chairs in the open air, as shown by the postcard below dated c.1916. The need to enable entertainment in less than perfect weather led to proposals for a concert pavilion. Such a pavilion, to seat 1,250 people on folding chairs, was eventually built slightly to the west of the bandstand and opened in July 1921. The bandstand now fell into disuse though it was not removed until May 1943, when the Parks Committee decided that it should be dismantled. 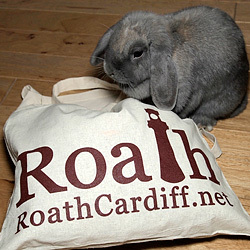 In Roath Park’s early years there were no houses close enough for residents to be troubled by noise and crowds. By the 1940s this was no longer so, with both Lake Road East and West being well populated with houses. This may have contributed to the ending of concerts and dances, though the popularity of music in the park inevitably declined with the growth of alternative entertainments. The pavilion was demolished in December 1953 following concerns about its safety and the recommendation that repairs would not be worthwhile. 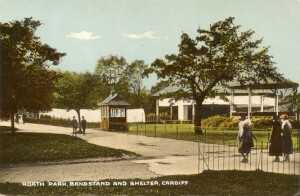 The (undated) postcard below shows the bandstand, pavilion and ticket office.